I used to follow the rule ‘If it’s not black, put it back’ while shopping. This was me in college - wearing black everything… even sarees! Inevitably, I got bored a few years after. Are you bored too? Time to infuse some colours into your Indian wardrobe, huh? Black sarees will never go out of style but you can’t wear ‘em everywhere, can you? At wedding functions, it feels odd to be dressed in black when everything is slathered in colours like lemon, lime, fuschia et al. 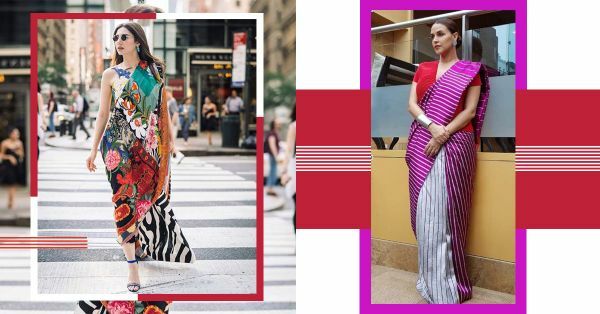 Indian wear, by nature, has always been about colours and well summertime is THE chance to start over with some fresh and colourful sarees in your closet. Neha Dhupia played with stripes and colours with this Payal Khandwala saree. This colour combination is a sight for sore eyes. Clubbing red, magenta and light grey, Neha’s saree is the perfect way to mix colours without being tacky. Who said coral is passe? Shilpa Shetty stands true to her title of ‘Saree Queen’ in this coral and pink Raw Mango saree. Warm colours like coral and orange can be paired with cold-tone shades such as royal blue and purple to avoid fashion faux pas. Bebo surprised us with this colour bomb of a saree. The Bollywood actress turned up the heat by pairing yellow and pink in this saree by Masaba Gupta. A stellar example of how to successfully pair two hot colours. Walking the streets of New York City in a saree is a feat and Mahira Khan works it like a boss. 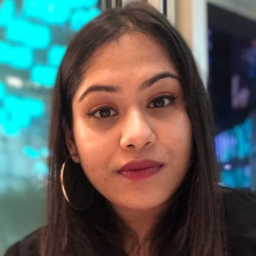 She couldn’t have chosen a more suited saree than this technicolour Sana Safinaz number for the ultra-modern city - so many colours in that print, we’re loving it! A hot red on an even hotter Priyanka Chopra. Fairly simple for an Abu Jani Sandeep Khosla design but looks perfect as it is, doesn't it? A hot shade like red looks best in solid - if it’s too busy, it’s wrong. 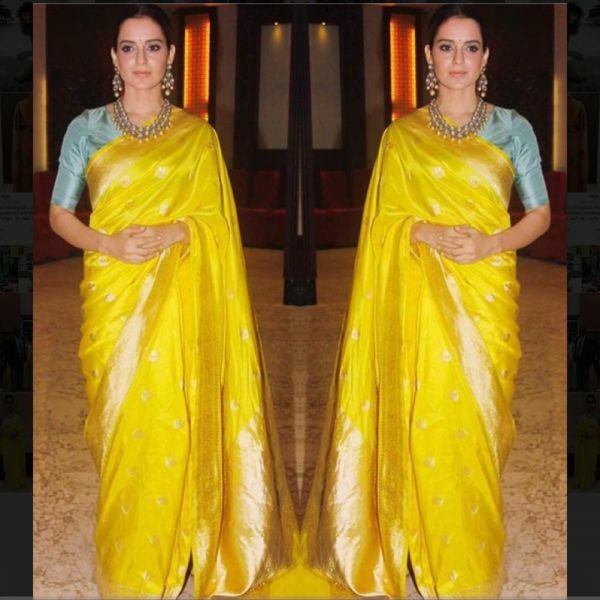 Lemon yellow is not easy to pull off but when paired with a pastel aqua you can actually manage to look stunning just like Kangana Ranaut here. Leave it to Raw Mango to kill technicolour pairings! 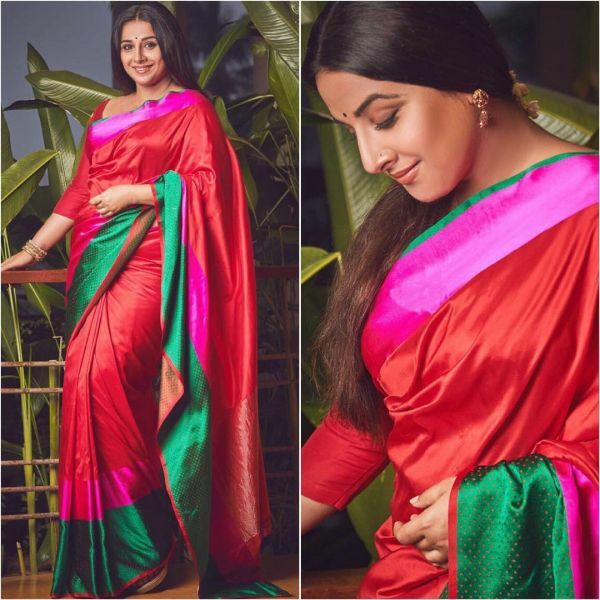 Now, Vidya Balan’s taste in clothes might be a little questionable of late but her sarees, - especially this red, green and pink number - are lovely. Good job, Vidya.